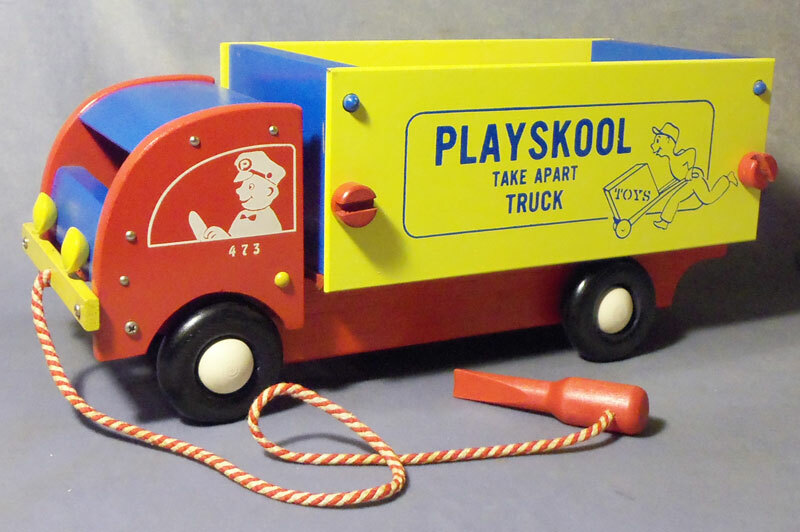 Description: This Take-Apart truck is both fun, colorful, and educational. The pull string has a screwdriver on the tip that can be used to disassemble and reassemble the truck bed. 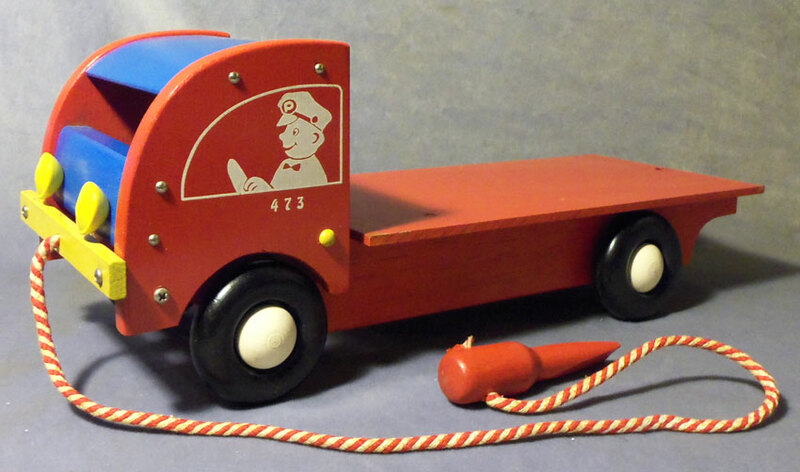 Truck - PSK331 - Large red wooden truck with a long red flatbed on the back. The cab has a blue roof, yellow front bumper and round yellow wooden headlights. Both sides of the cab have a white printed picture of a truck driver in a cab window (marked "473" under both windows). The cab tilts forward (hinged via metal screws) and has a red/white rope pull string attached to the front bumper. A red wooden screwdriver is attached to the other end of the pull string. The screwdriver fits into the screws on the take apart truck bed, described below. The truck rolls on 4 black wooden wheels with white wooden hub caps. Measures 16-1/2" long x 6-1/8" wide x 6-3/8" tall (to top of cab). 4 each - Screws - PSK332 - Red wooden screw. Measures 1-7/8" long x 3/4" diameter flat-head screw head. 2 each - End Piece - PSK333 - Blue squared end piece with 3 pegs on the edges (2 on top side edges and 1 on bottom center edge). Measures 5-5/8" wide (6-1/4" including both side pegs) x 4-1/4" tall (4-5/8" including bottom center peg) x 3/4" thick. 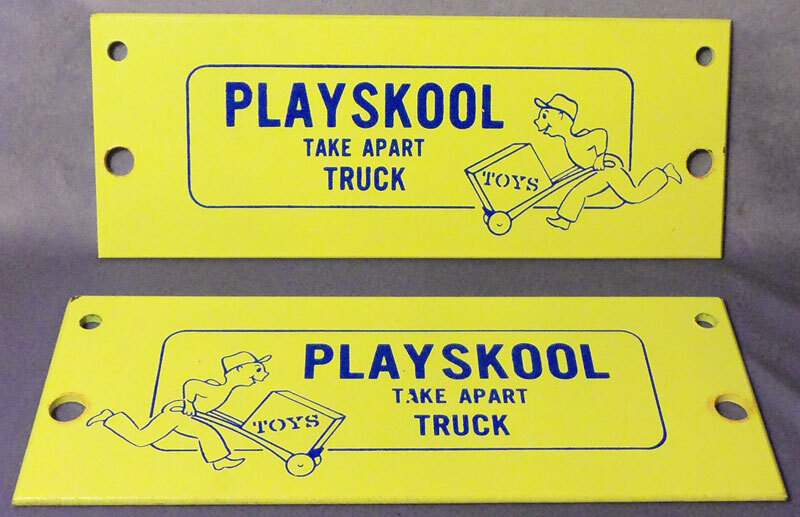 Side A - PSK334 - Yellow rectangular wooden side wall with 4 holes on the end edges (2 small holes on top corners, 2 larger holes on bottom corners) and blue print marked, "PLAYSKOOL TAKE APART TRUCK". 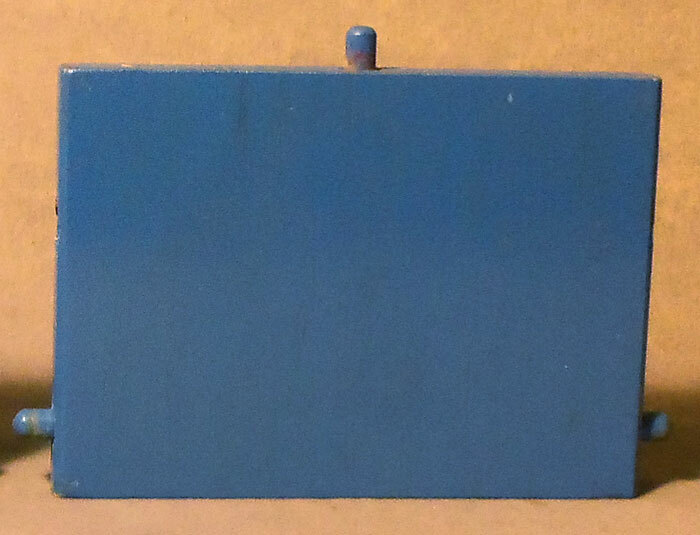 Has a delivery man pushing a hand cart on the LEFT side of the blue printed words. Measures 11-3/4" long x 4-1/2" tall x 1/8" thick. 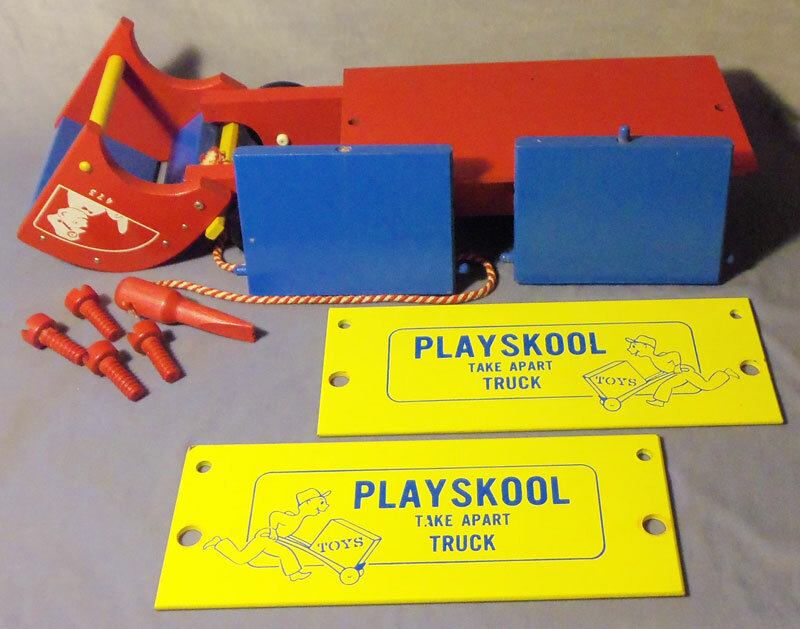 Side B - PSK335 - Yellow rectangular wooden side wall with 4 holes on the end edges (2 small holes on top corners, 2 larger holes on bottom corners) and blue print marked, "PLAYSKOOL TAKE APART TRUCK". Has a delivery man pushing a hand cart on the RIGHT side of the blue printed words. Measures 11-3/4" long x 4-1/2" tall x 1/8" thick. 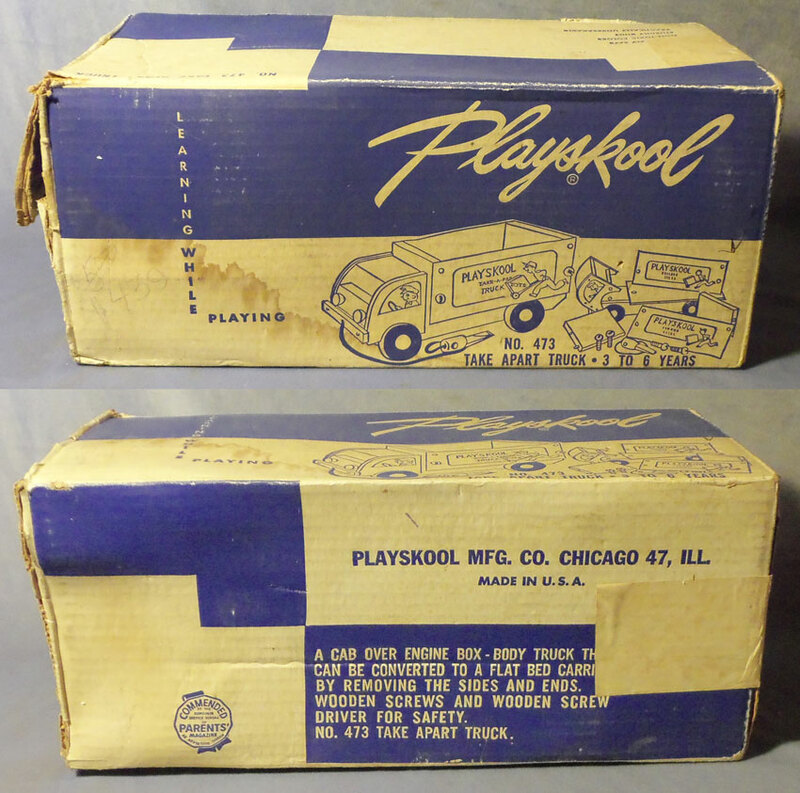 PSK336 - (Box ONLY) - Sold in a white cardboard shipping box with SOLID BLUE lettering and blue line drawing of the Take Apart Truck. 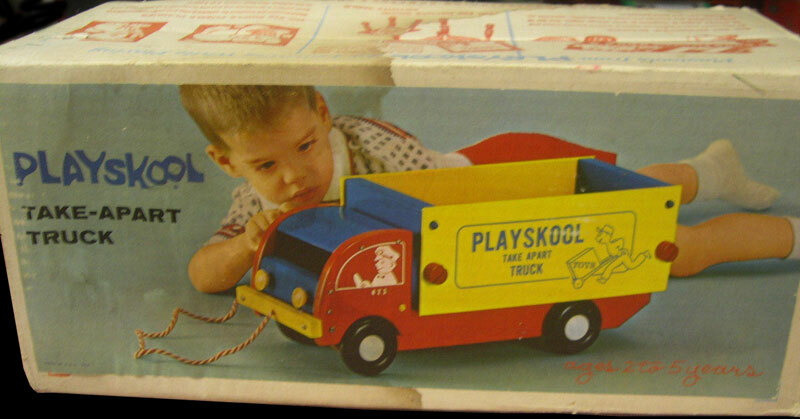 PSK338 - (Box ONLY) - Sold in a white cardboard shipping box with a FULL-COLOR picture of a boy playing with a Take Apart Truck. PSK339 - (Complete Set) - Complete #473 Take Apart Truck with white cardboard shipping box with a FULL-COLOR picture of a boy playing with a Take Apart Truck.